gDesklets is a GNOME program which provides the architecture for small applets (desktop widgets) to be placed on top of the user's desktop. 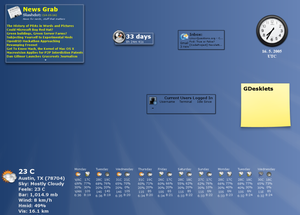 It is comparable to other desktop widget programs. The applets placed on the desktop are meant to be quick ways for the user to retrieve information and not get in the way of normal activity. Wikimedia Commons has media related to gDesklets.